Captain Pancho with a nice rack of sierra and a cabrilla. 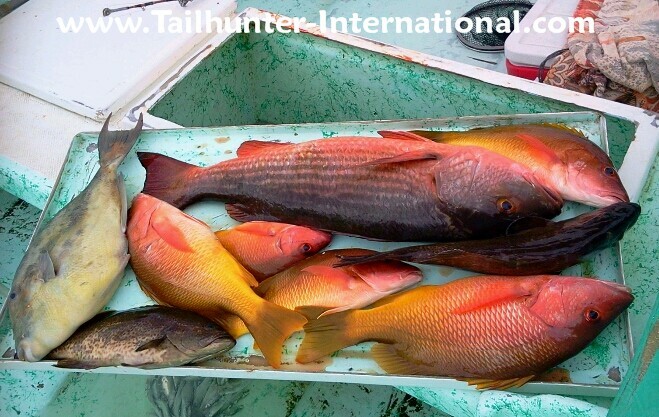 Pretty typical inshore winter catch of some great eating, pargo, snapper, cabrilla and triggerfish. 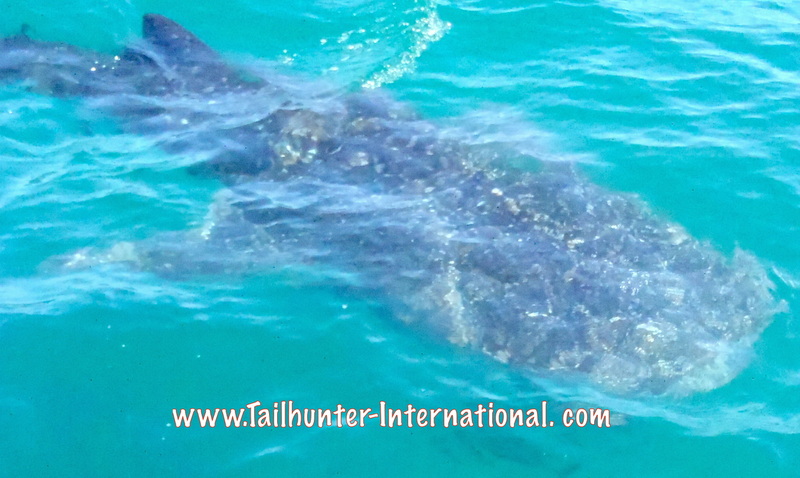 Incredible day trips right now to swim in La Paz Bay with the whalesharks in the shallow waters! On any given day there are up to several dozen 10-15 foot “juveniles” in the bay. Above or under the water, these gentle animals are a fantastic experience. This is about a 20 footer, feeding on the surface in only about 10 feet of water! SUNS OUT BUT SO IS THE WIND! The weather was tough on us this week. Quite a few windy days as is often the case during the winter months when the north winds come down and hit us and just make it difficult to get out or, even if we do, it’s just rugged out there or, the big waves make it tough to get bait. And that’s the way it was for the majority of the week. I feel badly because most of the folks that fish this time of year are snow-birds just enjoying sunshine who want a day of fishing while in La Paz. This is unlike during the regular season when folks fish every single day of their vacation and are specifically in town to fish. For the folks now with only one day to fish, that means we either have to cancel; or they have to just gut-it-out and have a rough day; or we have to juggle their fishing days to find a day where the winds are diminished. More often than not, we either have to tell folks who only have one specific day to fish that it’s best they not go out, or they go out and really just have a bad time and get beat up and wet and not catch much fish…and that’s not fun either. On the other side, at least it’s sunny! Day time temps are in the low to mid-70’s and really pleasant. Although it was windy, winds should calm down by the time you’re reading this. We did get out a few times this week. 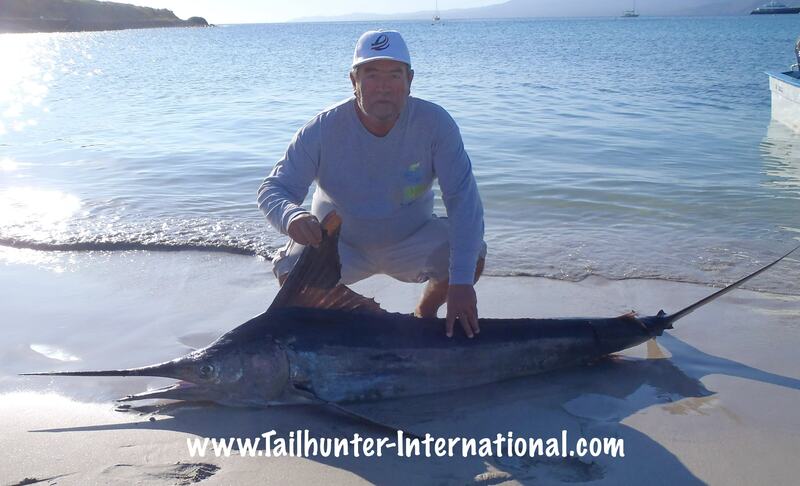 All of our fishing during the winter months are out’ve Las Arenas/ Bahia de Los Muertos areas. Because of the winds, waters are pretty turned over and green and dirty in some of our hot spots. However, we did get into some decent sierra along the beach drop-offs. Some were hefty 4-5 pound chunkers and ALWAYS great eating. There were a few small pargo, snapper and cabrilla caught. We had some school-sized rooster fish caught and released and the bonito helped provide some action as well. As a side note, many folks don’t know that La Paz has become quite a mecca for whalesharks which have been increasing in numbers the last few season in La Paz Bay where they’re protected. At times there are 1/2 dozen to several dozen “juveniles” up to 15 feet long or more all in shallow water and great for snorkeling! 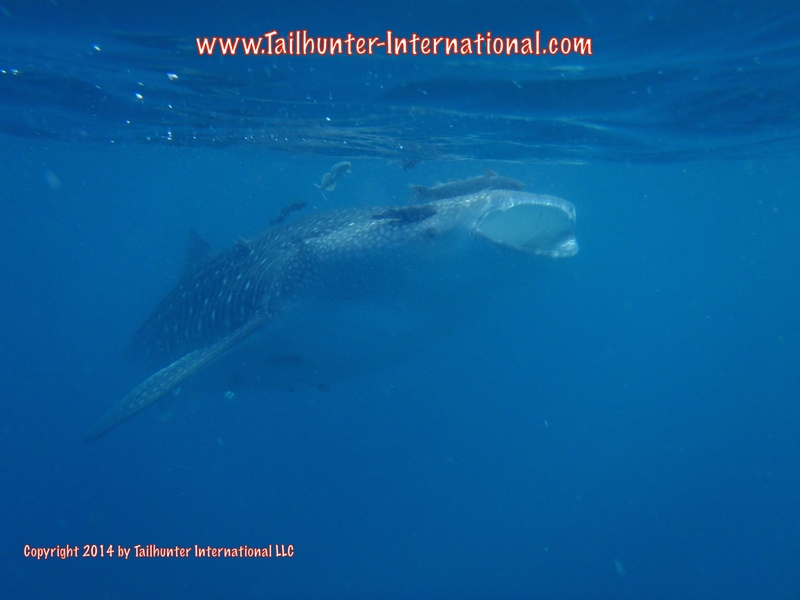 We’re running 2-3 hour trips to swim with the whalesharks every day that the winds are favorable. The juveniles are just a few minutes away and it’s an incredible family once-in-a-lifetime experience. You are NOT allowed to touch or ride the animals but still…getting just a few feet away from these gentle animals (they are true sharks with no teeth that eat plankton, krill and other small critters) is something not to be missed. OUR YEAR IN REVIEW! BRING ON 2015! It was as crazy a year as I have ever had in my almost 20 years working here in La Paz. With El Nino hovering, we entered the year with some trepidation. El Nino seems to have a zillion variables that change the whole complexion of fishing and sure enough, it started right from the get-go. El Nino conditions are characterized by warmer than normal waters. Good in some ways, but bad in so many others. So, crazily, our waters never really did cool down. We started the year catching dorado which was a great surprise in some aspects, but the downside was not so good. For one our cooler water species never really did show up. While the dorado were biting, we never got into the good yellowtail or the amberjack, sierra or pargo that are so popular in our cooler months. We got a few, but it had to be called a big disappointment. One aspect of the overly-warm water was the lack of bait. 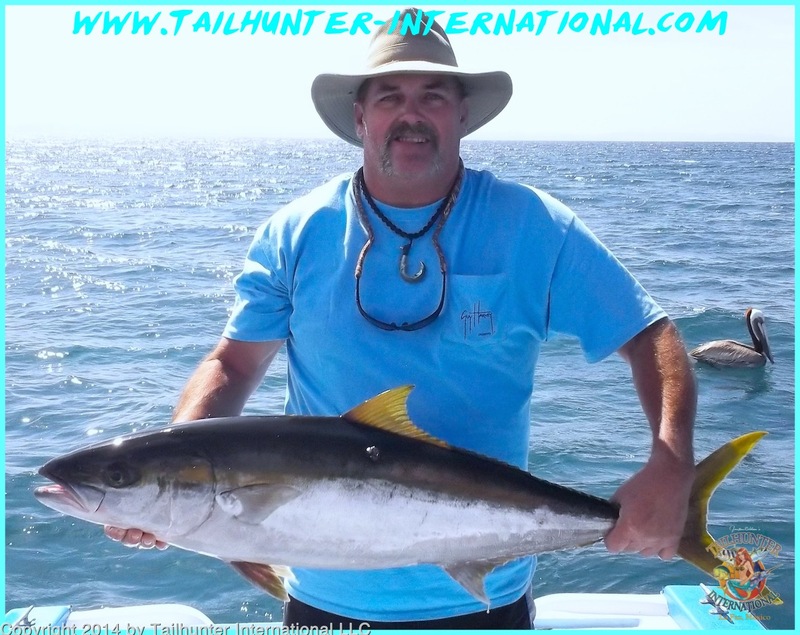 Tim Butterworth with a fat yellowtail caught with our Tailhunter La Paz fleet. 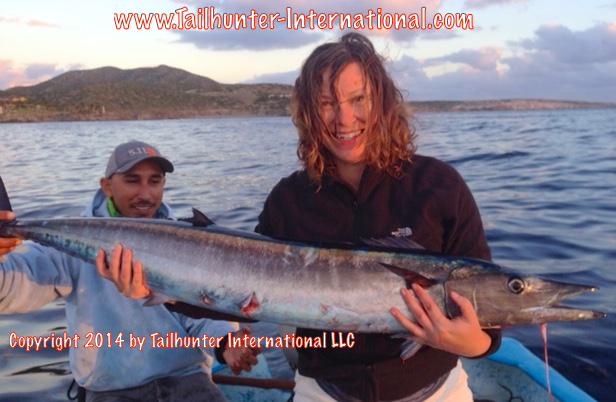 From Idaho taking a break from teaching school, Mandy Pollock let’s Tailhunter Capt. Boli struggle with this big yellowtail from the north side of La Paz. Still a few yellowtail around and this was Mandy’s first trip to La Paz. Jorge Ramiro, everyone’s amigo, with two nice spring-time dorado which showed up early this year with the warm waters! Baitfish require cooler waters so that nutrients come from the deep. The baitfish feed on the nutrients and without those necessities, bait either died off or moved away to find food. Insofar as we’re a live bait fishery and bait is an important aspect of our sportfishing, it makes it hard to fish, let alone catch fish without bait! This was to plague us throughout the year. It didn’t help either that in the Bay of La Paz, bait catchers from the fish farms were scooping up what little bait was available, sometimes at night leaving virtually nothing for the sportfishing fleets and commercial local fishermen who rely on the bait to make their livings. It wasn’t until almost mid-year that the bait catching stopped. Surprisingly, our bait stocks suddenly increased! But, bait was to be an issue all year long. We made do with what we could get. 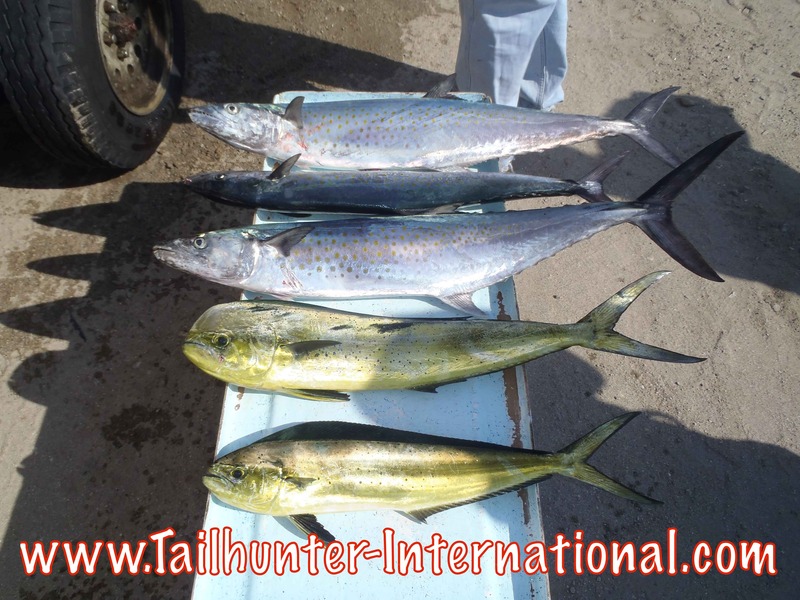 That often consisted of a mix of sardines, mackerel, caballitos, baby bonito, ballyhoo and dead bait like cut squid, cut bonito and the like. 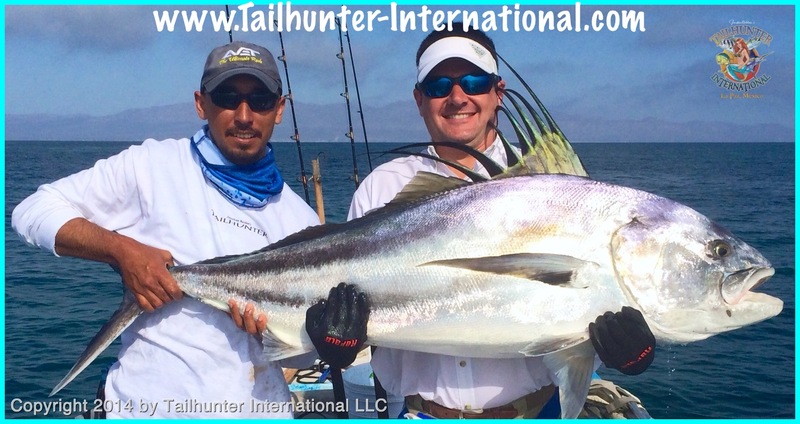 It will produced some great catches throughout the year like the dorado, marlin, sailfish and some others. The most remarkable catches of the year were the rooster fish and wahoo. We had an above average year for rooster fish underscoring La Paz’s reputation as the “Roosterfish Capital of the World” with fish in the 30-80 pound class not uncommon. 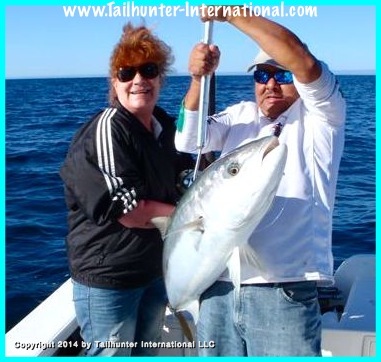 Kacie and Captain Armando put this nice big rooster in the boat for a photo then quickly released it! 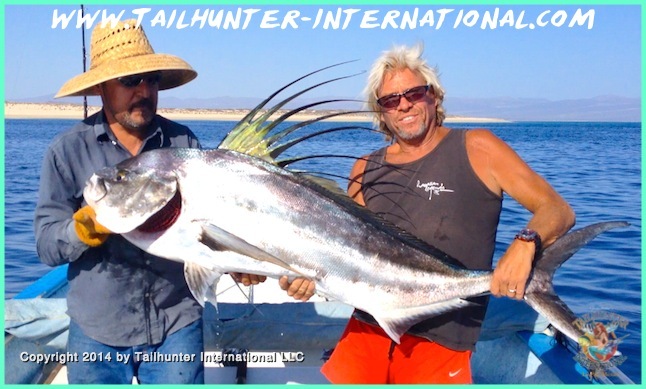 Captain Jorge and our buddy, Rick Kasper, always has the knack for big fish like this world-class huge roosterfish caught just off the shallow beach near the Las Arenas lighthouse then released. From Louisiana, Brian Davis stuck his giant roosterfish with Captain Pancho that might have tipped the scales into the triple digits, but was gratefully released. As for wahoo, the cycle came around this year. After a few years of negligible wahoo to show, we had a fairly outstanding year for wahoo with fish in the 30-50 pound class and larger often taken and the best spots around Espirito Santo Island. For folks who had never caught a wahoo or rooster, this was the kind of year where many anglers finally got their first of each species, sometimes on the same day. Lots of amigos got their first wahoos this year like Rich Pomeroy from Northern California who was on his first trip to La Paz. The biggest issue of our year was the weather. It played havoc all year. As is characteristic of El Nino years, storms are more common and we gritted our teeth and watched hurricanes and rainstorms threaten us and sometimes drop some rain on us and stormy conditions. We have over a dozen come our way, but dodged almost all of them until the big one finally turned on us in a surprise of historic proportions. 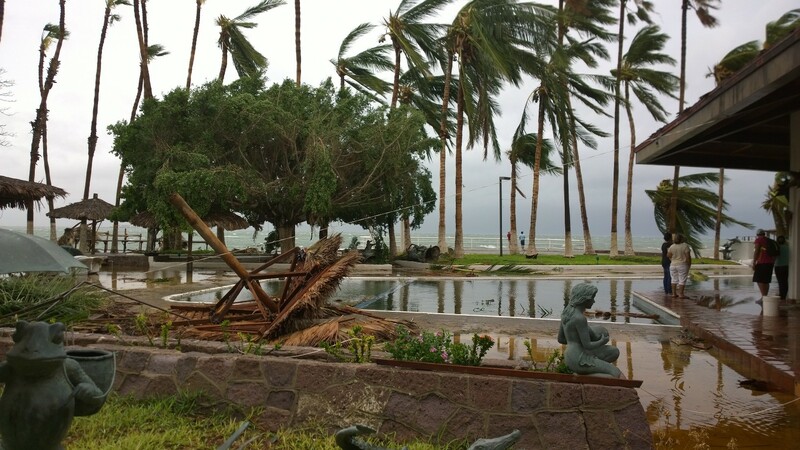 Hurricane Odile slammed into Baja with winds up to 150 miles per hour. 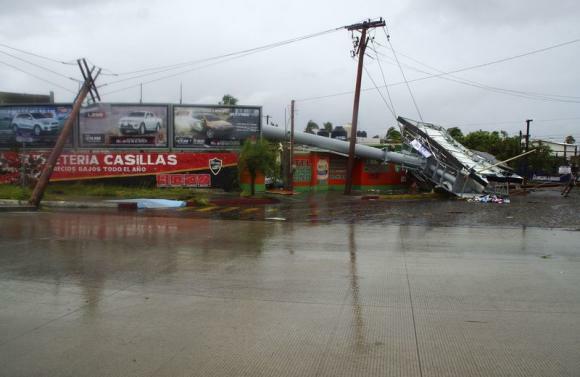 It turned out to be the biggest hurricane in Baja history causing widespread devastation. La Paz was in it’s path and, although the fury of the storm was spent in about 6 hours, the destruction and aftermath were felt for weeks and La Paz and Baja are still in the rebuilding process. Hotel La Concha in La Paz just hours after hurricane Odile ripped through. 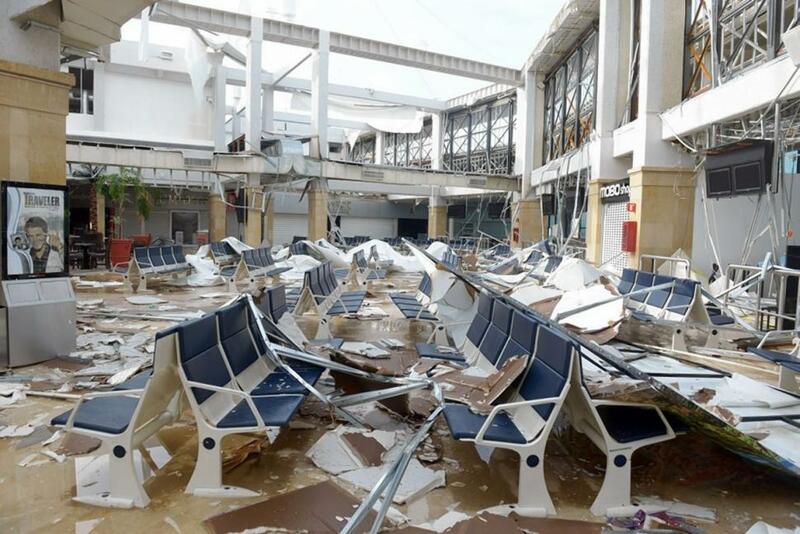 The Cabo San Lucas Airport was brand new but left in shambles. Hurricane Odile devastated neighborhoods. Baja is still re-building but financially, recovery will be long-coming . As far as fishing, we were back to fishing within a week of the storm. However, since airports were shut down or destroyed, there was no way for clients to come into Baja and hence suffered many weeks of cancelations and lost bookings during the part of the season which is traditionally the busiest time of the year. The ripple effect on much of the economy will take a long time to recover. But interestingly, right after the hurricane, fishing took off! 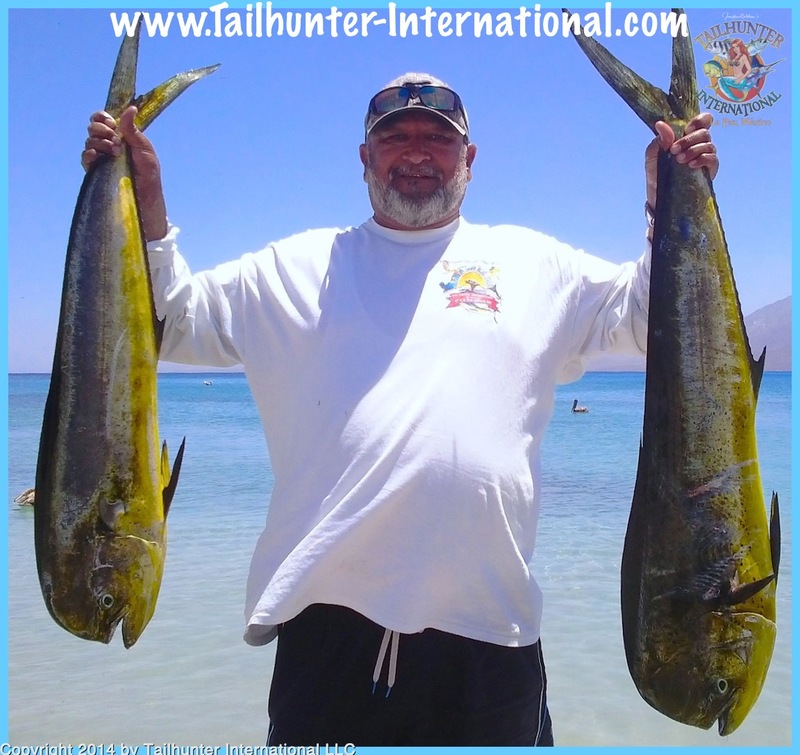 Some of the best fishing took place in the weeks and months post-Odile with dorado, wahoo, sailfish, marlin, and other species biting better than they had at any time of the year and with continued warm waters through Christmas, continued to bite! Bucket list marlin for Steve Snead from Idaho who battled this guy for a long fight despite his bad back and released the fish to fight another day! 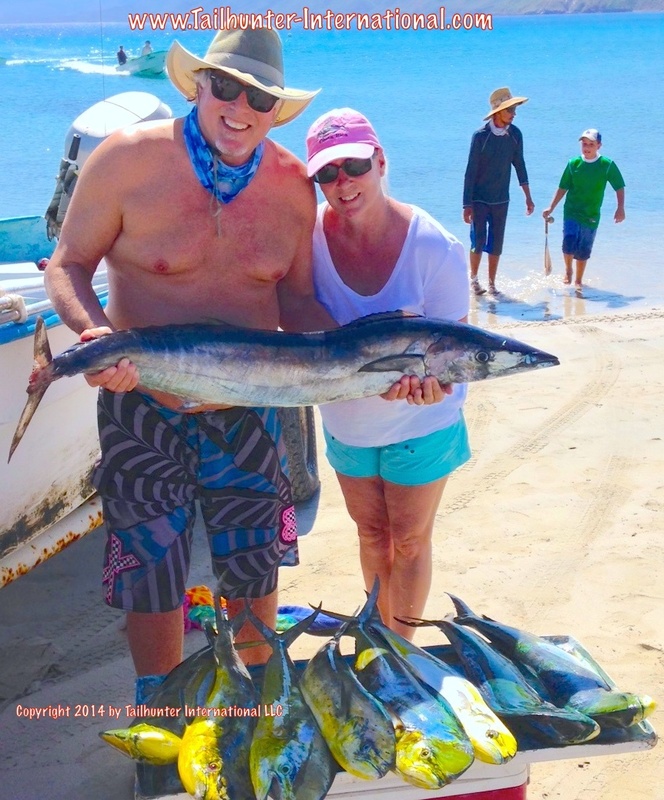 Craig and Cathy Corda had a gigantic nice day on the water with dorado and wahoo! 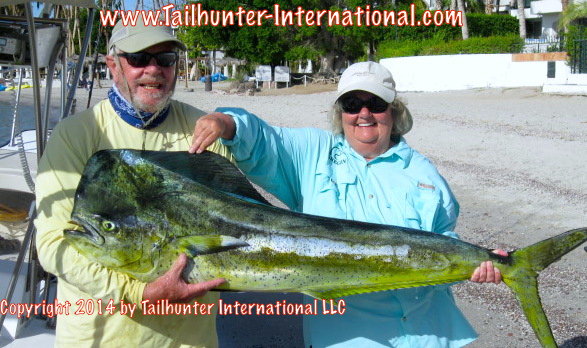 First timers, Mike and Robbi Caray with one of several big dorado caught with our Tailhunter La Paz fleet. Here’s hoping for a mo’ bettah 2014, but as long as all of us are safe, happy and have each other, all is good. Here’s to wishing you the best with a big MUCHAS GRACIAS for being part of this great adventure! God bless you all! A sample of the mix we’re getting right now which is interesting. Dorado, which are warm water fish, mixed with sierra (including some big ones!) which are cold water fish! 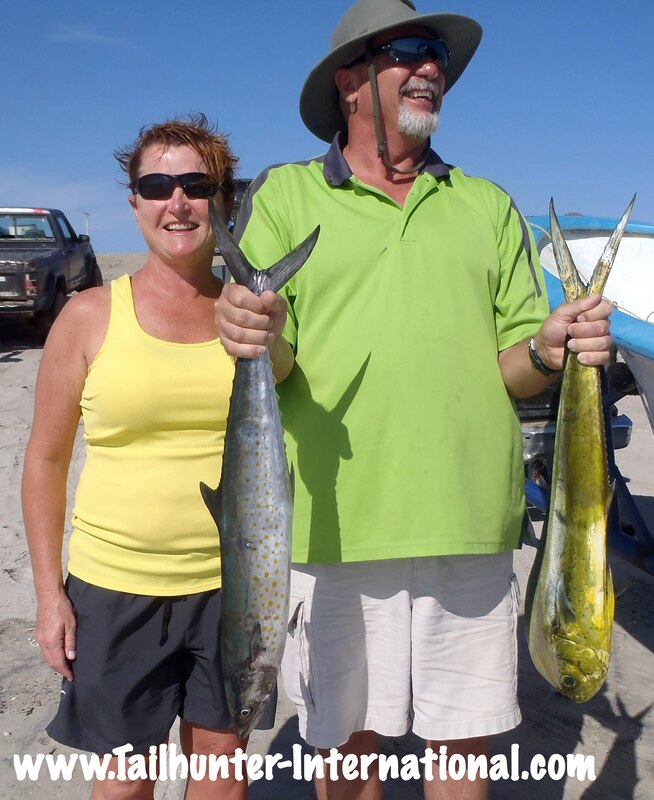 Shirley and Dan Owens have a sierra and a dorado headed for the dinner table at the Tailhunter Restaurant! Captain Victor with a sierra that’s headed to the ceviche bowl! I think this is the slow-down before the holidays. I think the whole city is just in “mellow Christmas mode” right now. Everyone is excited about Christmas, but it’s just very “tranquil” (peaceful) right now. I think every place is like that right now no matter where you live…unless you’re hitting a shopping mall in the U.S. Here in Mexico, Christmas season started well before the U.S. Thanksgiving. There’s no Thanksgiving holiday in Mexico so right about Halloween / All Souls Day/ Dia de Los Muertos stores start selling decorations, toys, etc. And people start buying and decorating and getting ready two months ahead of time. Homes have been decorated for weeks. Christmas trees have been up since the end of November (which means the live ones can be pretty dry by now!). Packages have been under the trees for weeks also. If you’re just headed out to buy toys or decorations now, you’re pretty much out-of-luck! There’s not much to buy. I had trouble finding a string of white lights last week for some that burned out already at the Tailhunter Restaurant! I had to go to 5 stores to find any Christmas lights! Anyway, not many visitors around either. Next week folks will come in for vacation, but many of them are snow-birds or folks just coming in for the holidays. Not many anglers around! It would be a good time to be on the water since there’s no pressure on the fish at all! We only had a few anglers ourselves. The only ones out there, for the most part, are the commercial guys. It was a little windy here and there and kinda bouncy and rough a few days, but that’s typical this time of year. As I’ve mentioned often, we are only fishing with our fleet at Las Arenas/ Bahia de Los Muertos because it’s calmer there and the fish are closer and there’s more variety. With our La Paz fleet, it’s just too rough many days and a long bumpy ride to the fishing grounds for erratic fishing. 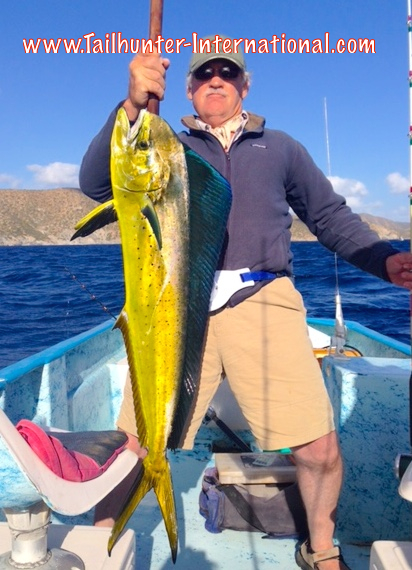 But, at Muertos and around Cerralvo, we’re still getting a few dorado up to about 15 pounds. Nothing big, but decent action. There’s still a few roosters around to about 20 pounds. Mostly school-sized fish although someone did latch onto a fish estimated at double that size. They never saw the fish, but it was hooked right there in the “rooster zone” near the Arenas light house and slammed into the bait like a big rooster. The clients had never caught a rooster before and kinda fumbled around and lost the fish! Oh well. Everyone had a laugh. There are still some great inshore stuff too. Sierra are becoming more abundant as the waters get cold and in the rocks, we got some decent cabrilla and small pargo. 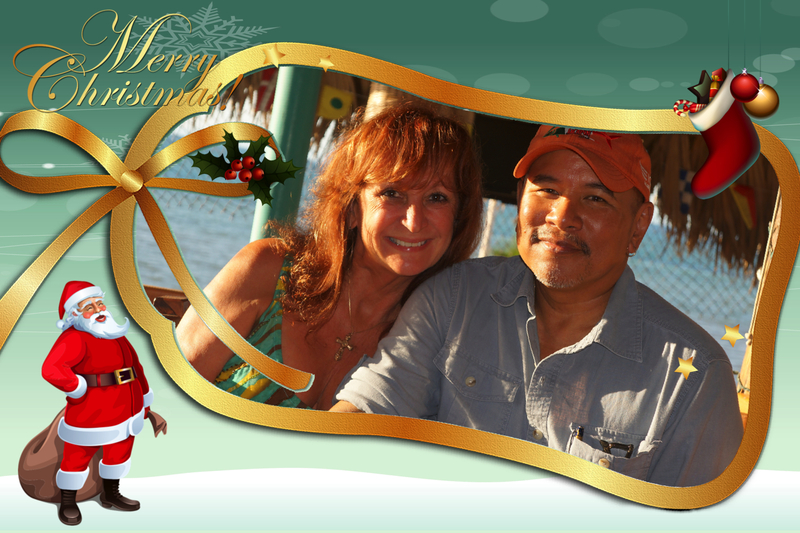 Jill and I wanted to take a moment to wish you all a safe, happy and peaceful holidays and Christmas season with many blessings and good wishes for an even better 2015! 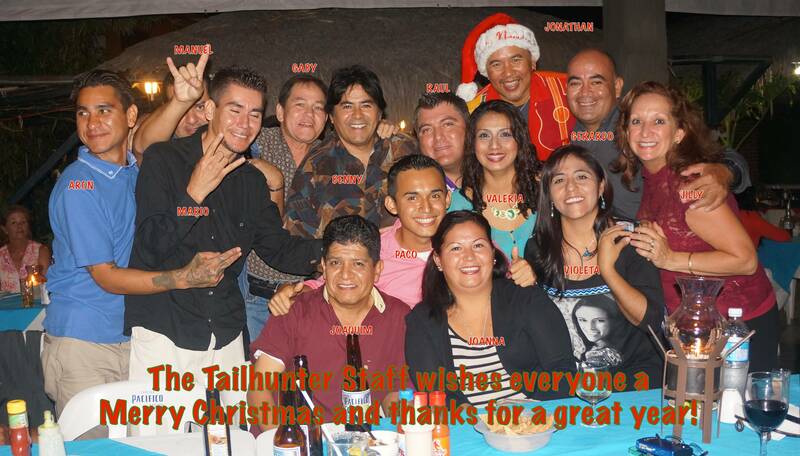 From our Tailhunter Staff to you…thanks for a great 2015 and best wishes for a great Christmas and next year! It’s been fun! 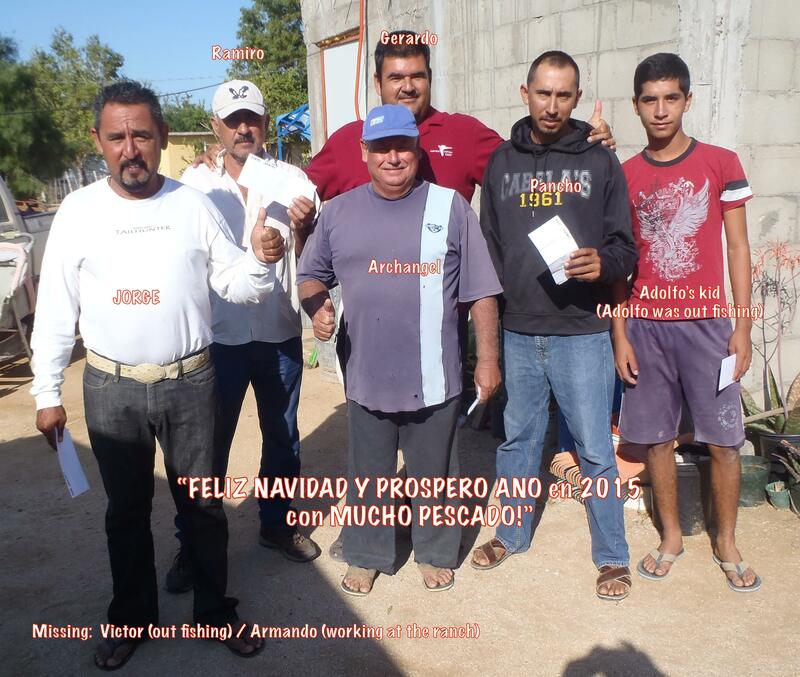 I did get some of our Las Arenas captains who are well known to so many of our clients to get together on a slow day to wish everyone a Feliz Navidad. Left to right…Jorge “Moscoron”…Ramiro “Juan Valdez”…Manuel Archangel “Arkie”…Gerardo “Albondigan”…Pancho and Adolfo’s son (Adolfo’s wife had him doing something. ). Victor was out fishing. Armando was working up on the ranch. Regretfully, I couldn’t get all our La Paz captains together at one time! That’s our story! God bless you all! Tracey and Brian Campbell were originally supposed to visit us last September, but Hurricane Odile got in the way . They were able to visit us this past week and get in some scuba diving, snorkeling and even a few days of fishing. 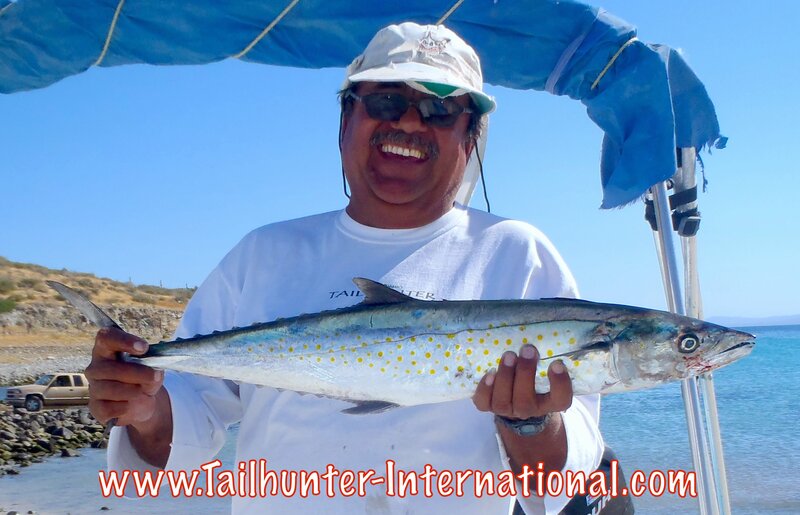 Day one produced some nice dorado for taking back to Maryland and for dinner at Tailhunter Restaurant! Carlos Cota just went out for an hour. That’s all the time he had. We went just past the point in about 30 feet of water to catch a few snapper for dinner and ended up with this striped marlin instead. Just shows some of the crazy variety right now. They weren’t able to release the billfish. Captain Jorge and Yolanda Wheeler, our amiga from Las Vegas got some HUGE sierra not too far offshore from Bahia de Los Muertos. This past week was much more characteristic of December fishing. We had a little wind. A little breeze, especially late in the day. Waters are turning cooler and so is the air temp, but the sun has been out all week and it’s a pleasant time to be in town. Not many folks are in town now so you have the waters and the town pretty much to yourselves. For the fishing, it seemed like it was different from day-to-day and panga to panga. 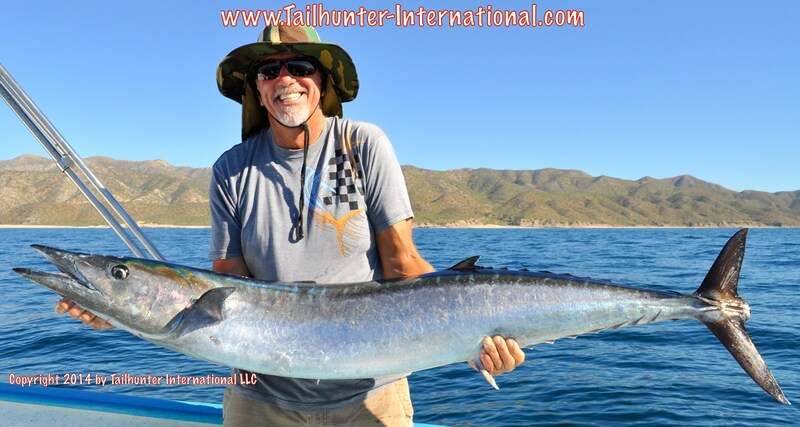 All of our fishing right now, is pretty much with our Las Arenas fleet, because the waters out of La Paz are more subject to the rougher waters and also greener waters not conducive to very good fishing. 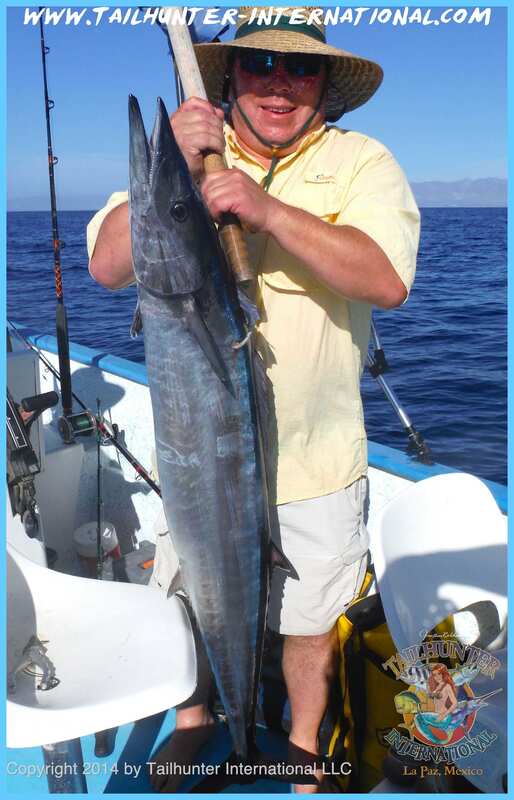 But, for the bite, we’re still getting some nice wahoo…some billfish…and dorado. Plus rooster fish seem to pop up ever few days as well. The problem now is that it’s not consistent. I tell folks there’s a big difference every day. If the blue water fish aren’t biting then the inshore fish like sierra, pargo and cabrilla be come the target or, if the waters are bouncy or rough, there’s just no way to go too far out and you’re relegated to staying closer inshore fishing structure fish like the species mentioned. The rub is that it’s hard to tell which fish will bite when. We do keep an eye on the winds and generally speaking if the winds are blowing from the north, then we’re gonna be fishing inshore and there’s not too much chance of blue water species. However, that being said, we DID hook a striped marlin this week less than 50 yards from shore in only about 30 feet of water and some of the dorado we hooked this week were close to shore as well! That’s our story! Hope your holidays and Christmas season are off to a good start! Lucie and her husband, Tom, only had one day to fish and said they’d be “happy with a small fish to eat for dinner at our Tailhunter Restaurant.” No pressure. No stress! Well, so much for that ! She caught and released this nice sailfish. See the photos below, she also got a wahoo. 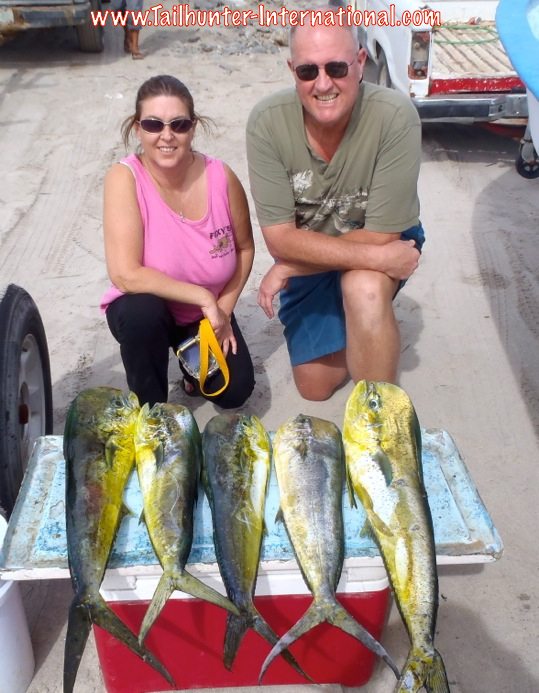 Plus the 3rd photo down, her husband also got several nice dorado! One day fishing…not bad! Guys come for years trying to get a wahoo. 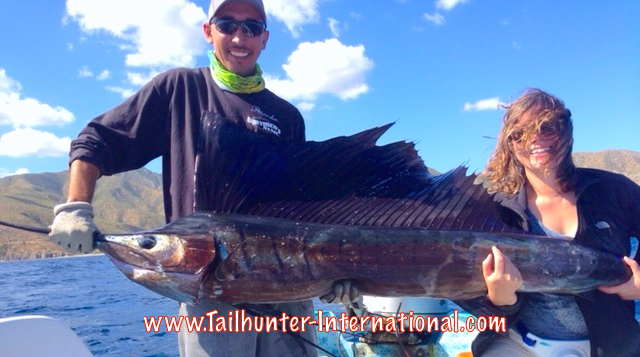 Lucie Merkle gets a sailfish (released) plus a wahoo and some dorado! Professor Tom Merkle from San Jose CA shows off another nice dorado fishing out’ve Bahia de Los Muertos on one of the days that the winds were down. 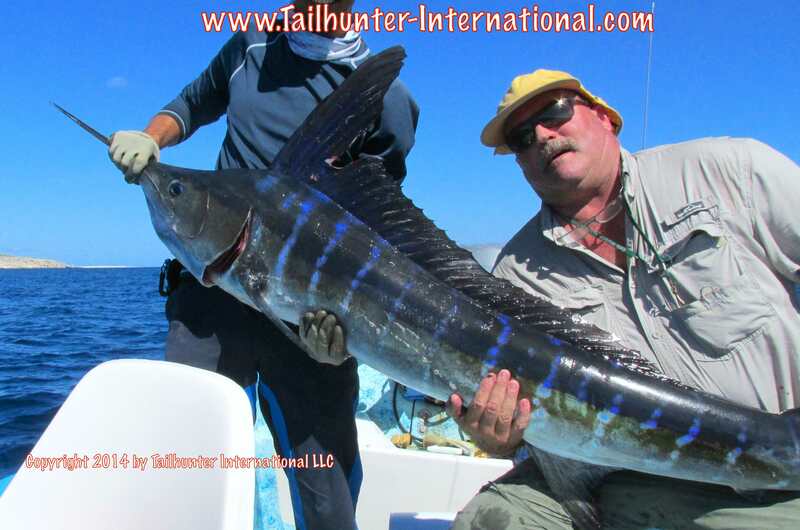 He and his wife also got a wahoo and released a sailfish! She is soooo good at this ! 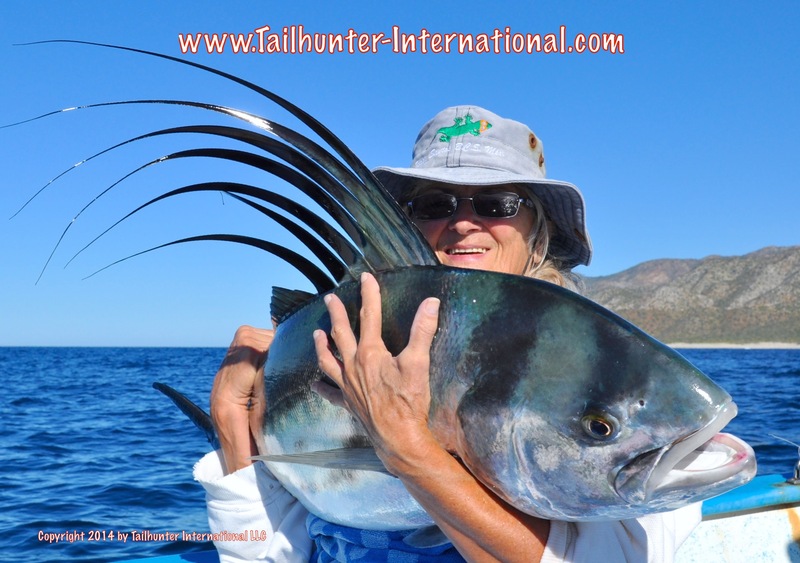 Donna Thompson got into the fishing report again with this hefty hefty roosterish in the channel between La Ventana and Cerralvo Island. This fish was released! Surprising to have such quality roosters still around this late in the season, but no complaints! Roger Thompson is a regular poster child for fishing our area and he always sticks big fish like this trophy wahoo he tries to “curl” for the camera! Nicely done (AGAIN! ), Roger! It was a tad on the breezy side this week as north winds seem to be gradually taking hold here as winter approaches. Still, some great sunny days to be in La Paz as the city takes on it’s Christmas face for the holidays. 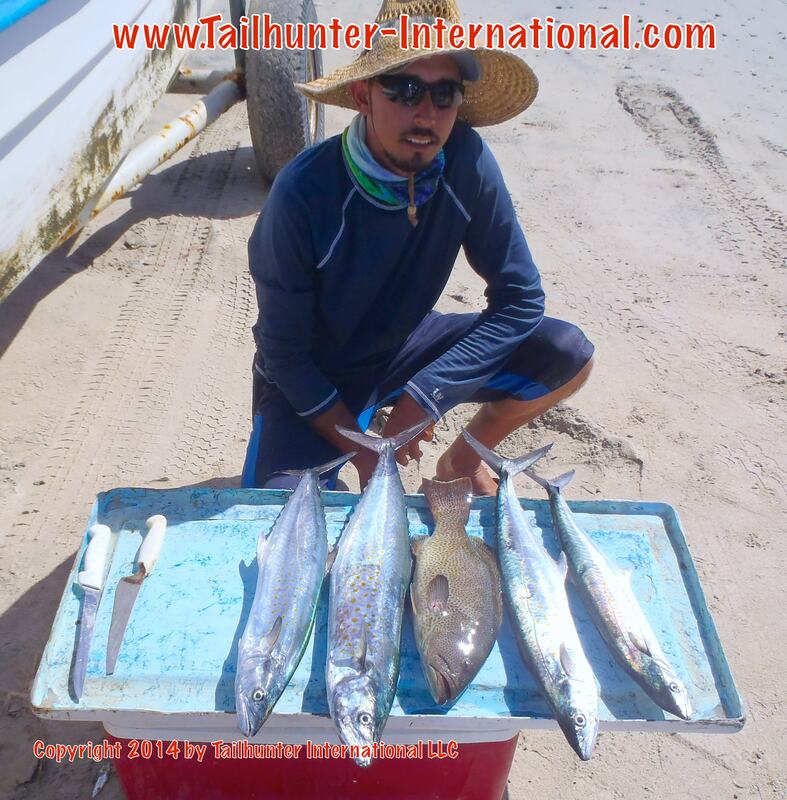 We’ve been doing almost all our fishing out’ve Las Arenas as the waters outside of La Paz Bay continue to be on the rougher side and often turned over and murky with fishing sketchy at best the last two weeks since the winds kicked it up a notch. However, with out Las Arenas fleet pushing off at Bahia de Los Muertos, even when it’s windy, we’re better protected and the fishing grounds are much much closer plus there’s more variety of fish. This week, there weren’t many anglers out, but there’s still some school-sized dorado meandering around. Most are about 10 pounds, but there’s an occasional 20-30 pounder still out there. Wahoo and billfish are not out’ve the question with most holding near the south end of Cerralvo Island, but there’s also been some bites just minutes outside of Bahia de Los Muertos just north of the big houses but before you reach Punta Perico. Inshore, there’s still some nice rooster fish to 30 pounds hanging around plus cabrilla and small pargo (snapper) in the rocks and we’re seeing more jack crevalle and sierra near the beaches as well.